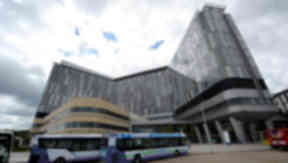 Waiting time figures show the poorest the Queen Elizabeth University Hospital in Glasgow has performed since it opened in May. 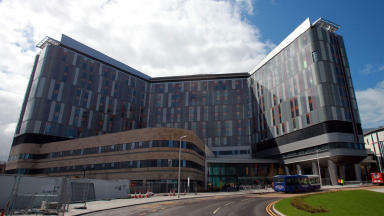 Performance against a key accident and emergency waiting time target has fallen to a new low at Scotland's flagship £842m hospital. The Queen Elizabeth University Hospital (QEUH) in Glasgow has dropped well below the Scottish Government's interim target of 95% of people being dealt with in four hours, according to the latest weekly figures. In the week ending October 4 only 77.2% of people were seen and either admitted, transferred or discharged within that time, the worst performing site in Scotland. A total of 386 patients waited for longer than four hours, with 29 of these in A&E for more than eight hours. It is the poorest the hospital has performed against the target since it was opened in May by NHS Greater Glasgow and Clyde (NHSGGC). Hospital director Anne Harkness said: "Our Emergency Department (ED) and Immediate Assessment Unit (IAU) were both extremely busy last week and we apologise to those patients who had a long wait to be admitted. "After a number of weeks where the A&E performance at the QEUH had shown a sustained improvement, these latest figures are particularly disappointing. "Our analysis for this most recent performance has shown that the new model of care within our IAU has been seeing significantly more patients than was projected. Elsewhere patients are also spending longer in hospital than we had anticipated. "We are fully committed to tackling these issues and are putting in place a number of immediate steps to improve the situation. "Additional capacity will be created within the IAU to tackle the bottlenecks by identifying an alternative location for surgical and urological patients coming through that unit. "We will also continue to work with staff to streamline all other clinical processes in particular early supported discharge. "Our staff are working hard to ensure patients attending the emergency department are admitted to a bed or discharged within four hours. "We are confident that these measures will see us return to an improved performance." In June the Scottish Government announced a team of experts would be sent in to help staff improve A&E waiting times at the site. Performance rose markedly as a result, with the hospital hitting a rate of more than 90% since the end of July. Health Secretary Shona Robison said: "NHSGGC has today announced measures it is taking to improve A&E performance at the Queen Elizabeth University Hospital. "It is clear improvements are needed at QEUH to further increase capacity and drive down waiting times, patients should expect nothing less. 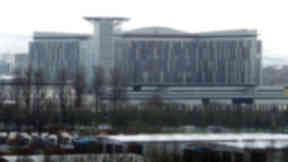 "The opening of the QEUH involved moving three existing hospitals onto one site and was one of the biggest and most complex of its kind in Europe. "Following the opening of the QEUH the Scottish Government committed £5m to support improvement across NHSGGC to relieve pressure at the front door of the hospital. "A performance support team was also on site at the new hospital for a two week period in June, and while performance improved, it has not been at the sustained level required." The latest figures show across Scotland, 94% of patients were seen within four hours, down from the 95% target the week before. A total of 109 people had to wait eight hours or more to be treated while no patients waited 12 hours or more. Ms Robison added: "I have spoken directly with the chairman of NHSGGC and have received assurances from the health board that immediate action is being taken to create more capacity in the immediate assessment unit in order to improve the flow of patients as well as working with staff to streamline clinical processes to support early discharge. "While the new hospital campus has greater capacity than the three it replaced, it is right that the health board has recognised demand at the QEUH has been higher than their planned operating model. "It is crucial NHSGGC make early adjustments to this service and Scottish Government officials will be keeping in close contact with the health board as they roll out the measures announced today. "Overall for the week ending October 4, 94.0% of patients were seen within four hours. 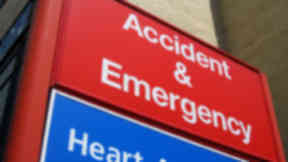 As we have seen before weekly A&E performance can fluctuate with figures varying week to week. "I know NHS staff across Scotland are working extremely hard to ensure the level of performance we saw over the summer period is maintained and improved upon as we head into autumn. "However, it is clear that more needs to be done especially as we head towards winter which brings extra pressures that affect performance. "We want to see long-term, sustainable change put in place in order to maintain a high level of performance during peaks and troughs of demand."